C-Bus Wireless Wall Switches allow existing, standard 240V AC wall switches to be replaced directly with a wall switch containing C-Bus Wireless technology, without any changes to the existing mains wiring. The C-Bus Wireless Wall Switches are 2-wire devices (240V AC Active and Load), with no Neutral connection required. The buttons on the front of a C-Bus Wireless Wall Switch are able to control a load connected directly to the unit and control loads connected to other C-Bus Wireless units. 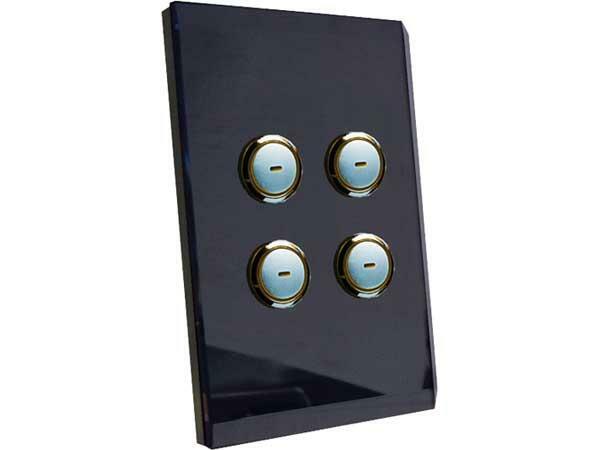 Each button can be programmed to function as an on/off, dimmer or scene control, as well as a number of other options. The Saturn Switchplates with integral 2 channel Relay can control 2 local lighting/load circuit of up to 4 Amps (fluorescent) rating and are available in either 4 button or 6 button configurations. Additionally, a 1 channel Relay version (see related items) provides control of one local light circuits or other loads. See options below for further details. Please note that colours other than white are considered 'Special Build' items by Clipsal, built to order rather than being 'Off the Shelf' and so the lead time for supply can be up to 6 weeks. As they are custom made for each job, Special Build plates are non-returnable (except for reasons defined under consumer laws).